Would you like to bring your children to Pyrkon? 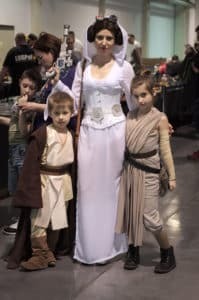 Never been to Pyrkon with kids before, and still wondering whether your pupils or you as a parent are going to find suitable attractions? This is the right place to find it out – on this page you will find everything to help you organize your visit on our Festival. All attendees under 18 must have a written permission signed by parent or legal guardian for the whole duration of Pyrkon. If you came to Pyrkon with your children, then below you can find useful information about how easily take care of their safety on our Festival. If you and your child got separated on Pyrkon, you can come to the Festival Office in pavilion 10. Our organizers will take care of the situation and do what they can to find the kid as fast as possible. Before you reach the Festival Office, please listen to radio communicates, and check your phone for missed calls. Maybe your child is already found and our volunteers try to contact you. 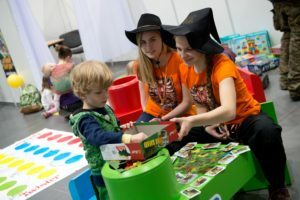 Every volunteer on Pyrkon is informed to take a child looking for the parents to the Festival Office. And if you met a lost child on the Festival and you want to help – go to the nearest Information Point or straight to the Festival Office. Children under the age of 6 can enter the Festival free of charge. As for participants under 12. we have arranged special tickets, allowing them to attend Pyrkon at half the price. More details in tickets tab. Since we truly care about comfort of all the fans, we have launched priority ticket desks specially for families with children, disabled and their care-providers (who can obtain free passes) and pregnant women. Thanks to this, the ticket distribution will run more smoothly, and the youngest ones won’t have time to get bored or tired by waiting in a long queue. The program at our Festival is selected in such a way, so that everyone could draw upon. All attractions aimed for those over 18 are visibly marked, therefore parents can easily control the selection of program and don’t have to worry that their pupils will come to contact with anything not age-appropriate. Kids Section is a special place for the youngest Pyrkon participants (up to 12 y/o). In two Pyrnooks children will have the opportunity to attend workshops, contests, lectures and meetings with authors. Everyday there are different attractions – experiments, spectacles as well as other amazing interactive exhibitions. In the Fantastic Lounge they will be able to play with toys and games, whereas for the youngest ones (up to 4 y/o) there will be a Fantastic Toddler Zone provided with a changing table and foam puzzles. All will be under the eye of experienced guardians and animateurs. Pyrkon, as well as a visit in the Kids Section, is a perfect occasion to dress up as favourite character. Does your little one adore Elsa, Batman or Obi-Wan? We would like to encourage all children to dress costumes up and become their idols even for a moment! For the past two years, as a part of Kids Section we have been organizing a Young Lecturers series, where it’s the children making program for their fellows. The Young Lecturer presentation must be reported in advance through a program submission form (more information about program submission will appear in January). On the entrance to the section there is a compulsory registration. It’s an extremely important procedure, which aims on protection of all pupils, who stay with us. You can find the binding rules right here.